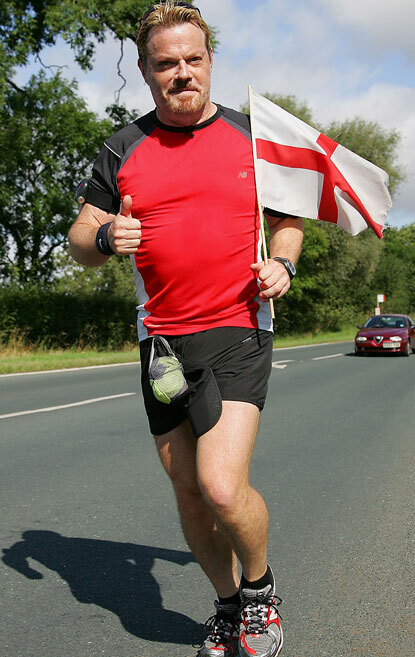 All I can say is that I have the HUGEST amount of respect for Eddie Izzard having watched him run around the UK – completing 43 marathons (1166 miles) in just 51 days. I’ve been a fan of Izzard for some time now, however his achievement on this has been staggering – it just makes me respect him a whole lot more – and shows a completely different side to him! The Special Sports Personality Of The Year award for 2009 was definitely well deserved. The 4 part programme was tucked away on BBC Three at a stupidly late time (why?!) and so I reckon many people may not have seen this documentary, however if you get chance please look the show up on BBC iPlayer – it is genuinely one of the most inspirational pieces of television that I have ever seen! Last night on Sport Relief they announced the total amount of sponsorship for him raised so far – a colossal £1.2 million (I put £30 of that in heh!…and there’s still more money coming in from across the country). An absolutely outstanding achievement I think we’d all agree. PLEASE SPARE A MOMENT (AND ANY SPARE CASH YOU MAY HAVE) TO SPONSOR EDDIE VIA HIS SPORT RELIEF PAGE!